Finding out that you are pregnant can spark a wonderful time in a woman’s life. Pregnancy may change the routines in your day-to-day life, including what you eat, how long you sleep, and how much you work. Of course, pregnancy can come with challenges like nausea, unhealthy cravings, swollen feet, depression, hormonal shifts, and stress at the thought of what life will be like when the new baby arrives. All of these experiences are normal, and thankfully, yoga is a fantastic way to navigate pregnancy no matter what stage you are in. 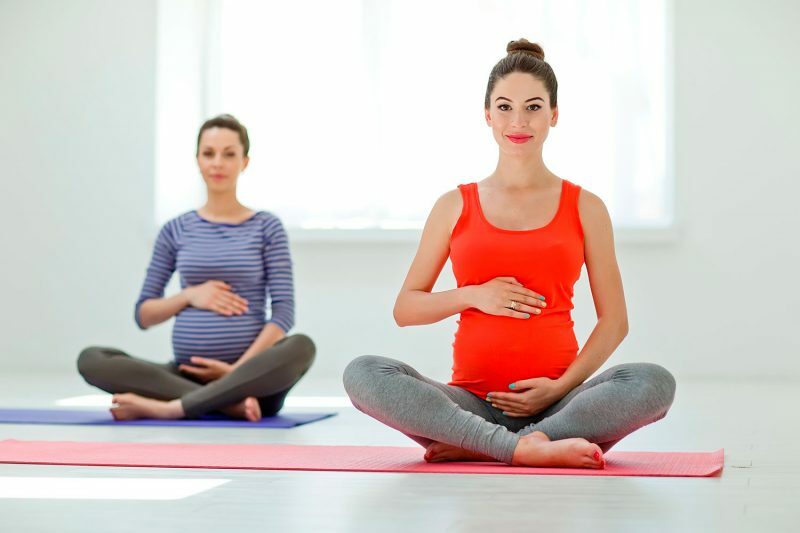 Whether you are new to yoga or a long-time practitioner, prenatal yoga has some amazing benefits – including reducing things like morning sickness, preparing your body and mind for delivery, helping you connect with other like-minded mothers and so much more! Perhaps the single most important benefit of prenatal yoga is that it gives you and your baby a chance to zen out. Unfortunately, life doesn’t go on hold once you become pregnant. Bills still need to be paid, you might continue working up until the last few months of pregnancy, and unfortunately there is no “pregnancy lane” on the highway that can get you out of the morning commute! Additionally, the very experience of growing a life inside your body can naturally make you feel more anxious and protective of your baby. Prenatal yoga classes offer a safe space for pregnant women to unwind, move their bodies, de-stress, and feel truly nourished. The yoga teacher will remind you to leave all your worries and cares at the door, and focus on making the class all about you. Yoga has real, scientifically stress-relieving benefits as well. Practicing yoga regularly can strengthen your vagus nerve and helps you switch from fight-or-flight mode to rest-and-digest mode. The more you practice yoga, the stronger your vagus nerve gets. Over time, practicing yoga can actually help you to feel the effects of stress less compared to those who don’t practice yoga. It is incredibly important for women to maintain social relationships during pregnancy and after childbirth – after all, friends are the ones who stick by our sides during the good times and the bad. In an article by Parents magazine, Susanna Sonnenberg, author of She Matters: A Life in Friendships, states, ” After you have a child, your life seems to revolve around your kitchen and bathtub. Just getting a meal on the table can be a big deal.” Having healthy friendships can help you remember that you are still human, even if you are sleep deprived and covered in cereal! One issue pregnant women might face is that their group of friends are in a different stage of life or are not having children at the same time. Getting into a prenatal yoga class ensures that you will meet other pregnant women and bond over your shared pregnancy experiences. You will be able to support one another both literally and figuratively through physical asana and by connecting in a nourishing environment. Once your baby is born, you can continue your relationship with the other mothers and who knows, your children might even enjoy being playmates one day! One of the most common reasons why women are prescribed bed rest during pregnancy is because they are showing signs of preterm labor. Preterm labor can be an inevitable occurrence for some pregnant women, but it can also be prevented in other through the use of yoga and other relaxation techniques. And that’s not a bunch of yoga-teacher mumbo jumbo either: Scientific studies show that when you reduce stress during pregnancy, your chances for having a premature baby decrease. The American Pregnancy Association also cites yoga as a successful way to reduce the chances of preterm labor. This can be due to both the blood pressure lowering and stress-lowering effects of yoga and pregnancy-approved breath work. Prenatal yoga isn’t just for women with a big baby bump showing either. Women who are in the early stages of pregnancy can benefit from prenatal yoga just as much. In fact, yoga is a terrific way to soothe the early symptoms of pregnancy. One of the many benefits of prenatal yoga is that it can dramatically reduce morning sickness. There are two reasons why yoga helps with morning sickness. The first is synchronizing movement with breath. This type of movement balances your mind and body. Although breath is an automatic function, when you control the breath you can shift your mind state and relax your body, which can lessen the nausea. The second reason why yoga helps with morning sickness is due to the way it balances your hormones. Nausea is brought on by the rapidly changing hormones in your body during pregnancy. Some of the heavy hormones involves are estrogen, progesterone, and relaxin. While these hormones are important because they help your baby grow and prepare your body for labor, practicing yoga can take your mind off the side effects and help you feel more balanced. It’s a well-known fact that exercise in general can increase your mood, and yoga is no exception. In fact, yoga causes your brain to release certain feel-good chemicals like GABA more than other forms of exercise. In one study, researchers found that 12 weeks of yoga dramatically raised GABA levels in participants brains and resulted in significant decreases in depression and anxiety. Because pregnancy involves such a massive life change, it is not unlikely for women and their partners to experience both depression and anxiety. Practicing prenatal yoga as a couple can be a wonderful way to connect with your partner before the baby is born and boost the feel-good chemicals in your brains. When you are in a prenatal yoga class, the teacher will show you how to move your body so that it makes more space for the baby, not less. A teacher in a traditional yoga class might not have the skillset to help you navigate your pregnant body. The focused movement taught in a prenatal class will be helpful to incorporate into your home yoga practice and in movement in your daily life. It could be helpful to have your partner attend a class with you as well so they can learn how to offer you assistance in your home yoga practice. Because pregnancy makes your body heavier in the front than in the back, there is obviously some back pain that can come with that! Starting a prenatal yoga practice in the early stages of pregnancy can also help you build strength and flexibility in the spine as your belly grows. The above yoga poses will give you a sense of space in your lower back and stretch your spine in several different directions. They are all safe to practice during pregnancy without any major modifications, which makes them excellent poses for your home practice where you are less likely to have access to special yoga props. Of course, something that is very important for women is to open their hips to prepare for delivery. During pregnancy, a woman’s body naturally releases a hormone called relaxin, which relaxes the ligaments in the pelvis, softens and widens the cervix. You can assist in the softening and opening of the pelvis by practicing prenatal hip-opening postures. Emotionally, hip opening yoga poses can also support a woman as she explores her own traumas. Being pregnant can bring up a lot of stored emotion around childhood and birth – not everyone had a picture-perfect birth. Believe it or not, many women release a lot of that stored energy when they are pregnant and in the process of giving birth. When approached with an open heart and a loving support system, the process can be incredibly rewarding and life-changing for a woman. Hip opening yoga poses work with the psoas, which is a major muscle group in the hips that is known for storing suppressed emotions. It is not uncommon, pregnant or not, to cry or feel rushes of negative emotions when opening the hips. The good news is that once complete the practice, you usually feel a whole lot better! One symptom many pregnant women loathe is swollen feet. Prenatal yoga can dramatically reduce swelling of the limbs by getting lymphatic fluids moving and improving circulation. In this way, practicing yoga during pregnancy achieves a very important goal for women by reducing uncomfortable sensations. When a pregnant woman in uncomfortable, it can actually cause her body to switch into fight-or-flight mode. This sensations tightens the muscles and increases things like back pain. So, even the small act of reducing swelling of the feet can have massive benefits for the whole body! Your hips and back aren’t the only part of your body that need support during pregnancy. Giving birth is a full body experience, and it is also important to strengthen and tone muscle groups that support your pelvic floor as you give birth. Standing poses that strengthen the legs and thighs are incredibly helpful for pregnant women. Toning and lengthening the pelvic floor itself can also help you have a smoother birth experience and minimize the discomfort of pregnancy. It’s clear that prenatal yoga is a fantastic tool for pregnant women. It can reduce stress and help you have a healthier and more enjoyable pregnancy. Additionally, yoga is a wonderful spiritual practice that can help you connect with your baby on a soul-level before they enter the physical world. When you are pregnant, everyone (even complete strangers) have something to say about your body and baby. This unsolicited input can be overwhelming, and yoga can help give your mind a clean slate so you can focus on what is truly important during pregnancy – connecting with your unborn child! Whether you plan on having a natural birth, hospital birth, home birth, circumcise, vaccinate, or hire a midwife doesn’t matter (despite what others might say). Ultimately, yoga can give you the space to make decisions about your body and baby with a clear mind and from a heart-centered space and truly experience the magic of pregnancy!